On Page 3 of this thread, "Mountain Rd(rt 108)Attractions from Stowe"Aspen talks about Brook Rd and a covered bridge. Can anyone tell me where that is? I can't find it in my atlas or in the Barna Covered Bridges book. Thanks. Sharan: It's probably Emily's Bridge on Gold Brook Road. Check it out in Barna's. Scenic Drive, DRIVING ROUTE - New for 2013, NEK Southeast! The east central part of the NEK is dominated by Victory Basin and the two mountain ridges that surround it (Burke/Kirby Mtn ridge and Stone-Miles Mtn ridge). These physical feature and the general lack of population make for a relative lack of good (decent to drive on) roads in the area. US Route 2 bisects a good portion of this area as well. This route also covers a lot of different elevations, from Lyndonville (700') to the top of the pass of the Kirby Mtn Rd (1700'), back down to the banks of the CT River (850') and back up to the top of the Victory Rd (1900'). So somewhere in that range, you should find some good color . Starting again at the Colonnade Inn in Lyndonville, just off of I-91 Exit 23. Highlights include East Kirby. Shadow Lake (Concord), East Concord, Lunenburg, Neal Pond, CT River Valley, White Mtn views, Victory/Granby Rd. Burke Mtn, Ridge Rd. This route takes you to the Mid-Burke Lodge area on Burke Mountain and past the entrance to the Toll Road that goes to the top. I recommend the Toll Road and the Fire Tower if you have a very clear day. The Victory Bog Option bypasses going all the way to Guildhall in favor of going through the heart of Victory Bog between North Concord and Gallup Mills. Adding this road sort of cuts the region in half. I HIGHLY recommend driving through the bog if you get a chance. You can also add the River Rd/Victory Rd driven as an option to the full loop. When driving the Full Loop, you will encounter the north end of Victory Rd when you go through Gallup Mills. It is about a 10 mile drive to the other end in North Concord. Once you hit Route 2, turn around and drive back to Gallup Mills. This way you have twice the chances of seeing a moose! I also left Waterford out of this route do to its isolation South of I-93. I should create a short driving route in that area as well for those with a short time window. Note: There are very few towns along this route. Lancaster, NH is easily the biggest, just across the CT river on Rt 2. This would probably be a good place to stop for lunch, rest rooms, etc. Last edited by From_the_NEK on Wed Sep 21, 2016 2:17 pm, edited 7 times in total. So nice to see the Scenes of Vermont Fall Foliage Forum active with folks making plans for another Autumn of exploring and enjoying, beautiful Vermont! This is in reference to Sharan's inquiry where the Covered Bridge is located off of Route 108 in Stowe. It is not Emily's Covered Bridge. Emily's Covered Bridge is over off of Route 100. Emily's Bridge is also a nice covered bridge to visit when in the Stowe Hollow area. On the page 3 thread which I shared of different places to enjoy along Route 108, several Autumns ago, there was this nice covered bridge off Route 108 on Brook Road which was very easy to miss. If anyone comes up with the name of this particular covered bridge, add it to this thread for the Route 108/Mountain Road drive. As you pass Edson Hill Road which will be on your right side, watch for Brook Road coming up on your left. Again, want to share that Route 108 is jam packed with so many things to see and do while in Stowe. Route 108 concludes with that MUST experience drive through Smuggler's Notch! Keep on driving on Route 108 until you arrive to Smuggler's Notch. Click on the Recreation Path Map to enlarge it. Last edited by Aspen on Tue Sep 17, 2013 7:03 pm, edited 1 time in total. Thank you Aspen. Covered bridges are one of my favorite things in Vermont! Access to information on eleven of GoStowe's great driving routes in and nearby Stowe, Vermont has been updated on the Great Vermont Driving Routes thread. Go to page 3, look for topic: Stowe: Popular Driving Routes. With stories filtering into the Foliage Forum that the colors in the Northeast Kingdom are approaching peak, many leaf peepers will be heading to the Northeast Kingdom this weekend and within the next few days. Some familiar with the Northeast Kingdom have suggested driving Darling Hill Road in Lyndonville, Vermont. For those who may be driving along Darling Hill Road, keep an eye out for belted cows grazing in the pastures of Meadow View Farm. If you have never seen a belted cow, this may be your opportunity. Belted Galloway cows are a special sight to behold. Several Autumns ago, there was an exciting discussion on this Forum about the Galloway belted cows that may be found on some farms in Vermont. We drove past the Diamond Heart Farm in the Northeast Kingdom in Irasburg where we saw out first belted cows. There were black cows with white belts and also brown cows with white belts. The cows looked like their white belts had been painted on them. It's a special sight and wonderful picture op to experience seeing the belted cows grazing in the pastures. Belted cows may be found in other towns of Vermont. Once we saw our first ones, we could easily recognize them on other farms. You may be assured that seeing these special belted cows for the first time in such a beautiful Autumn setting will moo-ve you! After you've trekked from Stowe to Jeffersonville via Smuggler's Notch via Route 108, you'll reach a Y. Bear left onto Church st. (if you bear right, you're on Main st., with the exceptionally good Alden Bryan and Visions of Vermont galleries). Turn left at first road, Upper Pleasant Valley Rd. Follow Upper Pleasant Valley Rd. SW a little more than 2 1/10 miles to Bryce Road, a dirt road to the right. Follow Bryce road to its high point (there's a large farm perched there), stop and look back at the vista that includes Mt. 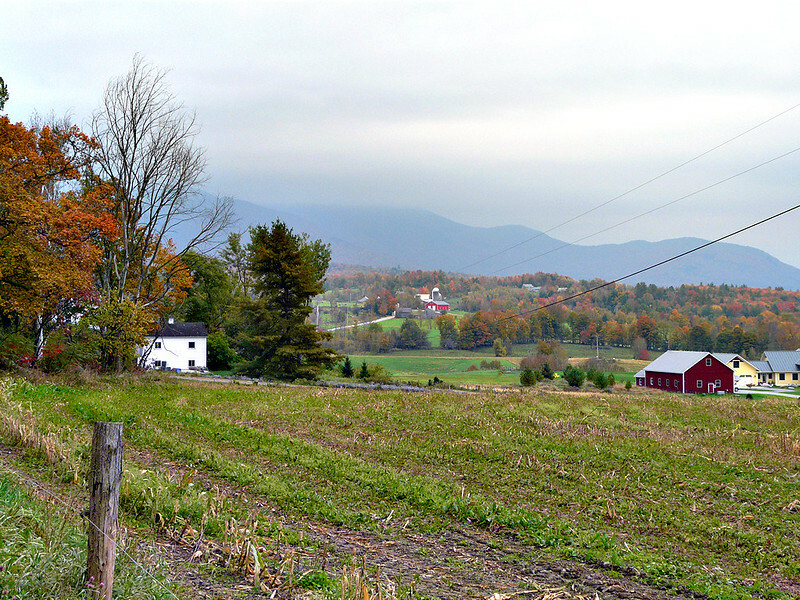 Mansfield and several picturesque Vermont farms and structures. Continue on Bryce which (Oct. 2, 2013) is very well maintained to Lower Pleasant Valley Road. Turn left on Lower Pleasant Valley Rd. Many pleasant views of the highlands to your left where Bryce Rd. runs. Follow to the first stop sign -- which is Upper Pleasant Valley Rd. Then either turn left back to Jeffersonville, or right to Underhill Center, with (when the road reaches King Rd.) one of the most pleasant country stores/delis ever, the Underhill Country Store. Great sandwiches and service. Right on King takes you to Route 15 (where a right turn heads you back to Cambridge & Jeffersonville; a left turn lead you to Jericho and The Red Mill.). Re: BEST SCENIC VIEWS/MUST SEE SPOTS! We went up to Northeast Kingdom Oct. 2 & 3. Took the tour someone posted here with google map, starting at Lyndonville, north Pudding Road, Lakeview Road, across top of the Lake, up Hinton Rd, then south on 114. Tue it was very cloudy, you could see color but it needed SUN! Beautiful colors on 114. Wed AM we went back up on 114, it was very nice. Then did the loop around Danville, Peacham, Groton etc. It was OK.
Coming home we went over to Littleton I-93, just before Fanconia Notch it was fantastic!! OMG OMG. Best color with blue skies, & sun. We've been going up in this area for the past 30 years, so we've seen some wonderful sites and some bad years. I love this forum for all the great up to date info and giving driving directions. For the past few years I have made probably three tries to find Pikes Falls, appropriately just off of Pikes Falls Road. I hate wasting prime foliage time in these misadventures so this weekend I made one final attempt. Success! I diligently tried to follow website directions but could not locate it. It is 4.8 miles from the intersection of route 30 and Pike Falls road in Jamaica. The main reason for finding this set of falls is that it appears there are several deciduous trees to provide fall color. There are several composition choices to make this site even more appealling, but the effect of the sun limits prime image taking to cloudy or pre sun rise times. As you can see the falls are not giants. On the plus side because of the narrow slide it may not need a recent rainfall to stay active. I'm a sucker for Grist Mills. Is there a website that lists them for Vermont? I know of the ones in Weston, Jericho, Guildhall, Vergennes, 108 just South of Jeffersonville. Any others that are scenic? 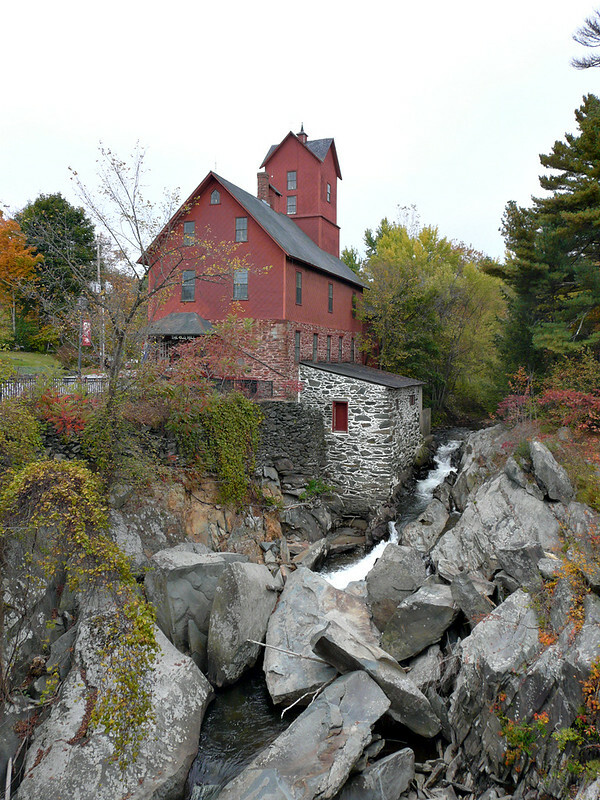 It is a National Historical Site of an 1885 gristmill. It is a beautiful and scenic area throughout all seasons. The museum has an informative exhibit of snowflake research/pictures by "Snowflake" Bentley. Not all of my favorites but, a nice chunk. I also enjoy the walk along the West River very much. 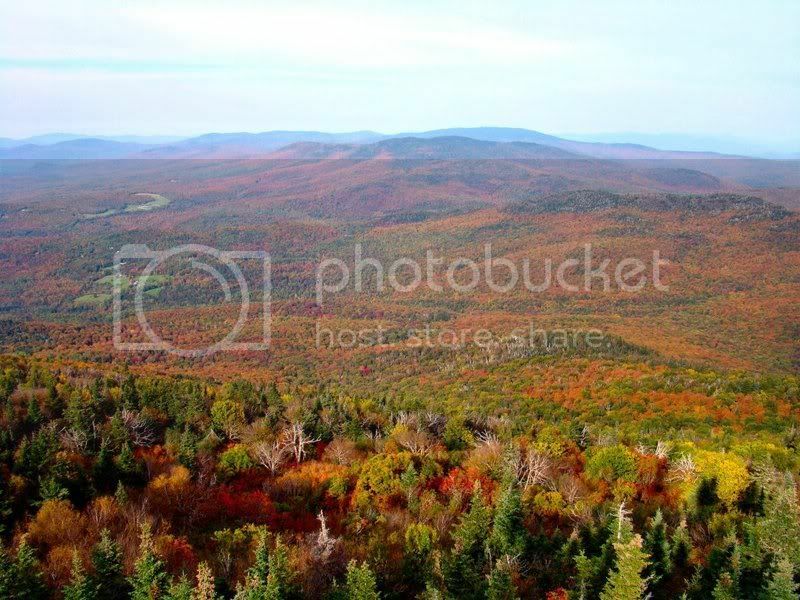 We are visiting Vermont for first time this weekend between 9-12th Oct for fall colors (staying in Tunbridge on friday night and in waterbury on Saturday and Sunday night)..
We would like to do some scenic drives, visit a water body(lake,pond or reservoir for morning shot with fog), check out some covered bridges with back drop of fall colors and hopefully some farms.. Some of routes i picked up are below, please suggest if it would be nice this weekend? One more spot we picked up is Groton State Park - Kettle Pond and Owls Head Hike after seeing some fantastic pics.. Also please let us know if there are other photo ops or points which we should check other than Owls head? Please help us with some suggestions on covered bridges and water bodies for early morning with fog and reflection and have always loved them..
Also any farms around to take pictures of cows with backdrop of fall colored mountains? Highly appreciate your inputs for making our trip memorable.